About Valentine City Centre Guesthouse family-run professional year-round bed and excellent breakfast, central location in Tollcross, closest to edinburgh castle, Hume tartan history, Edinburgh Information. About Valentine Guesthouse professional year-round bed & breakfast, central location in Tollcross, closest to castle, Hume tartan history. 19-21 Gilmore Place, Edinburgh. EH3 9NE. 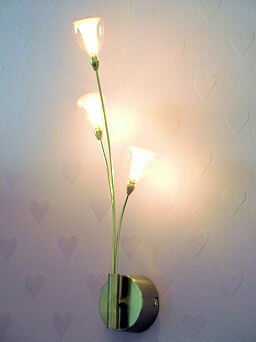 The Valentine City Centre Guest House is within Edinburgh’s City Centre at the South-West corner of the Old Town. After our recent expansion it is now situated on all four floors of an 1813 Georgian Town House, a significant building in Edinburgh's history being a prototype of the Edinburgh 'three-door flats' layout later used throughout the city. Such a historic building can have no lift of course, but if you book a room on one of the upper floors up the wide original stair case, then we will of course assist with luggage if you would like. We operate in a modern and professional manner- a year-round guesthouse and NOT a family home simply renting out spare rooms. You will receive a key to the guesthouse and your room which gives you full access during your stay; there is no 'locking-up' time at night, and no period when you must vacate during the day between nights that you are staying. Our new ground floor breakfast room serves breakfast for twice as long as most guest houses and is not used for any other purpose. All our laundry is washed, dried and ironed in-house, so you will not fall asleep to any chemical smells on your bed-linen, and those who are allergic to industrial laundry chemicals can rest assured that the worst you should find on our laundry is a clothes-peg mark!! ALWAYS A HAPPY FACE WHEN WE SEE YOU - GUARANTEED! Check-in is normally from 1pm onwards, but in the case of early arrivals; luggage can of course be left with us in the event your room is not yet ready of course. Arrangements exist for late evening/night arrivals, but we don't ask you to pay for the costs of a 24 hour reception, so guests are expected to provide a estimated time of arrival (which can be updated at anytime), and to be able to contact us by mobile phone. We serve 100% pure fruit juices, Kelloggs cereals, Scottish Porage, unlimited tea, fine filter coffee, or hot chocolate; unlimited white/wholemeal toast, eggs to order (fried, poached, scrambled or boiled) and an unbeatable range of items typically included in a Scottish cooked breakfast. Every breakfast is cooked to order (no buffet or re-heats here!) from your selection of link or Scottish lorne sausage, bacon, haggis, black pudding, tomato, egg, mushrooms, baked beans, potato scone or fried bread. We also serve vegetarian breakfasts and lite bite options such as boiled eggs, items 'on toast' or in a sandwich (or 'buttie'!). Our Location: The closest Guesthouse to the Castle!!! If you have not stayed with us before, we are situated at the beginning of Gilmore Place on the South West corner of the city centre, within walking distance of all city centre attractions. We are 10 minutes walk to Prince's Street and15 minutes walk to The Royal Mile and Edinburgh Castle. We are situated adjacent to theatres (we are the closest accommodation to the King’s Theatre), restaurants, cinemas, pubs, shops, and a short walk from the Edinburgh Conference Centre, and Edinburgh/Napier Universities and all major tourist attractions. Car Parking in any City Centre is always difficult and/or expensive. Free daytime on-street parking does not exist anywhere in central Edinburgh. 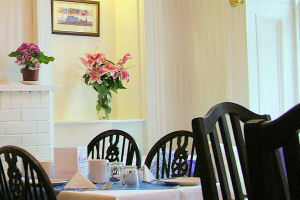 We can offer limited car parking 80m from the guest house which needs to be reserved in advance at just £10 per night. Commercial car parks range from £18 to £30 per day. We also have secure arrangements for Motorbikes. Our buyiklding predates the invention of the car by a century! Lothian Bus number 10 from Princes Street and number 27 from Hanover St/The Mound/North Bridge (Royal Mile) stop right outside our door. Many further services run across the end of Gilmore Place, less than a one minute walk away. See our directions page for more detail. To make a booking, you can call us on the number below, or use our Availability & Online Booking. You can find out more about our rooms and facilities here. The closest Guesthouse to the Castle in the very heart of Edinburgh. The finest of full Scottish breakfasts is included every morning of your stay, entirely cooked to order. Why is this part of the City Centre called Tollcross? A long time ago, cities raised part of their finance by charging a toll or tax to enter the city, ironically there was a proposal to do this again recently in Edinburgh as a 'congestion charge'. One of the tolls to Edinburgh was in the area now known as Tollcross centred on the junction where the famous clock now stands. The pillar clock at Tollcross was gifted to the City of Edinburgh, by Provost Sir James Steel and Treasurer Cranston in 1901. It was one of four similar clocks in the city made by the Edinburgh Clockmakers, James Ritchie & Son. Originally a pendulum clock, in 1926 it became spring driven and was wound once a week by the makers. In 1969 it was converted to electric mechanism. When, in 1974, the crossroads area was being improved to accommodate the widening of Earl Grey Street, the clock was removed and later, after much public pressure, replaced close to its original position. Why is it called Gilmore Place, and where does the name 'Lochrin Annexe' come from? Gilmore 'Street' was constructed in 1798 through property owned by Samuel Gilmore who owned a large ropemaking factory on the north side of Gilmore Place, as it became known. Older maps (eg 1830) show the spelling as 'Gilmour', which is probably the original authentic spelling. *correctly pronounced 'Hume' if [presumably] the Street was named after the Scottish Philosopher David Hume - more on the 'o' versus 'u' below!). Which Tartan is it down the left margin of some pages? The tartan used on the website is the Hume tartan, this is the adopted tartan of the Wilkinson family that own the Valentine, first used at the marriage of Rob Wilkinson and Vicky Hume. As Vicky was prepared to take Rob's surname, it seemed only appropriate that he and subsequently their children have taken the Hume tartan (The clan links for the name Wilkinson are very weak). 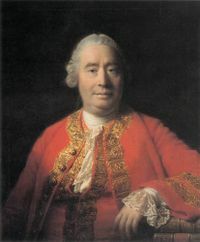 The tartan actually belongs to both the Hume and Home names, both pronounced 'Hume', the 18th Century Scots Philosopher David Hume changed his name from 'Home' to 'Hume' - some say because their were aspects of his family's history he wished to distance himself from, others say it was in frustration at the constant misprounciation of his name!. The small picture used for the tartan has been repeated or 'tiled'to create this background - can you spot the technical error in the design that this introduces? So Why 'VALENTINE' City Centre Guest House? The Valentine is named after James Valentine, a very important figure in Edinburgh's tourism history. His Father John started a printing Business in Dundee in 1825. Ten years earlier he had a son, James, who went on to take over the Business, and expanded the company into the increasingly popular 'cartes de visite' and then the publishing of photographs. The company grew through his children and published for several decades around the 1900's many postcards of Edinburgh (and later the rest of Scotland and the UK) that are now an important archive of Victorian Edinburgh. A large collection of his work is on show in the Edinburgh Room of the Central Edinburgh Library on George IV Bridge. 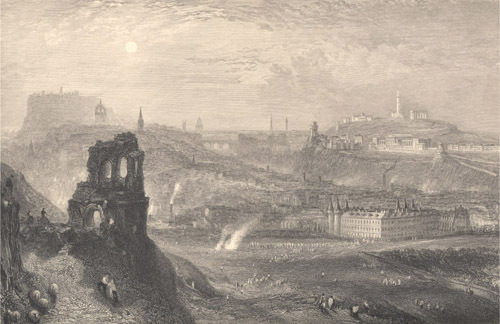 They now have a fantastic collection of on-line views of Edinburgh called the Capital Collection. In 1861 James Valentine was one of seven founding members of the Edinburgh Photographic Society, a respected organisation which is still going strong today! The Valentine Company went on to become a household name in the UK as a publisher of greetings cards. It lives on now as part of Hallmark cards, but the Dundee factory closed in 1994. Is it true Edinburgh was once in England? Founded as a fortress town by Edwin of Northumbria (North East corner of what was at that time England and is again now though was not always in between!) in 626, Edinburgh was captured for Scotland by Malcolm II ('Malcolm Canmore') in 1018. Although Dunfermline remained the nation's capital, Edinburgh rapidly became its major metropolis. The city was occupied and the Castle sacked by Edward I of England in 1296, but was retakened by the Scots in 1313. Robert the Bruce granted Edinburgh a Royal Charter in 1329, and by the 16th century, it had supplanted Dunfermline as capital of Scotland. 1836 view of Edinburgh from beyond St Mary's in the Royal Park - not that different today, a great view for climbing the easiest part of Arthur's Seat. Please use the menu links across the top of the page for further information or to check availability and price for your stay. Home - our home page and welcome! What You'll Find - Our bedrooms, the dining room, the annex, with pictures! Policy - The rules! Terms and Conditions, most of which we think work in your favour. Availability - Get our best quote on your trip dates. Nothing here but technical stuff! !